My husband and I did one night away and the Captain Fairfield Inn, and we loved it! Terri was warm and welcoming and gave us a great recommendations for restaurants in town and for morning walks. The room itself was perfect - comfortable bed and sheets, cool décor, well appointed, clean. The location was central and easy. The breakfast was delicious (go hungry!). I wish we could have stayed longer - we can't wait to go back! We were warmly welcomed by Terri the innkeeper and introduced to our beautiful suite called the Lark, room 1. Terri made us feel welcomed by showing us around and making sure we knew how everything worked. The spacious suite had a fireplace, soaking tub and a private porch off the bedroom. We were presented in the morning with the yummy smell of the beautifully prepared breakfast. Meticulously kept we enjoyed our short getaway so much and will return in the summer for a longer stay in the charming town of Kennebunkport. Captain Fairfield Inn was the perfect romantic getaway. My husband and I were fortunate to spend 5 days in Kennebunkport during off season. Terri and Roger were the most sincere and wonderful Inn Keepers. They prepared a delicious breakfast every morning and scrumptious baked goods in the evening. Our room was cozy with a fire place and a modern beautiful bathroom with soaking tub. Dock square is a 5 minute walk to all restaurants and shops. Terri and Roger were the perfect host. We were thrilled to be there for fresh fallen snow and most thankful for Roger clearing our car and all the walkways. Many thanks for a memorable stay. We came up for a low key weekend to celebrate our BabyMoon before our little one arrives in May. The Captain Fairfield Inn was wonderful, and it exceeded our expectations! We stayed in the Lark Suite. It was a spacious and immaculate room, with a bathroom to die for! Terri and Roger are such generous hosts, with freshly cooked breakfast and beverages every morning in their beautiful dining area, and sweet treats put out every night. They accommodated us in every way we could have asked. The inn is an easy 5-8 minute walk into the center of town but it is so quiet because it is tucked away. We will definitely be back!! It's rare to find a disappointing town along the Maine Coast.... so it's all about finding the right place to stay. I think we found it when we came across the Captain Fairfield Inn! 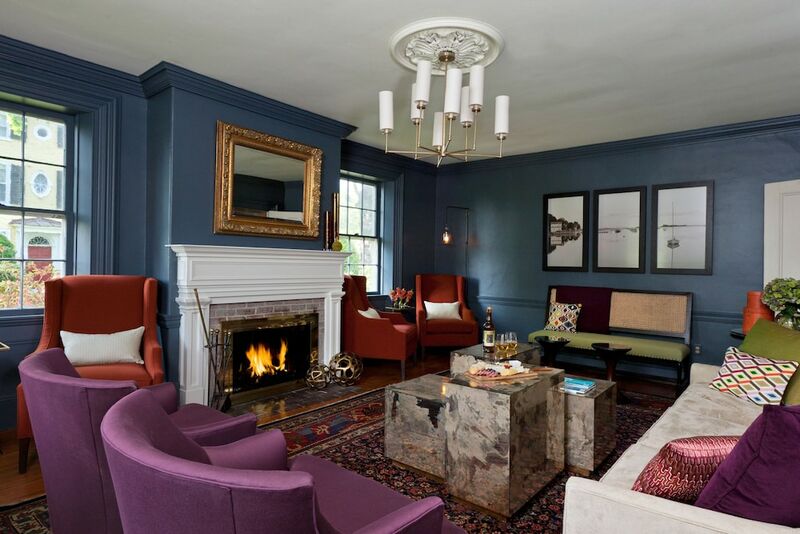 Charming inn in a perfect New England town. Terri and Roger are engaging and wonderful innkeepers.... we enjoyed chatting with Terri over breakfast. Our room was very spacious with a wonderful comfortable bed and gas fireplace. Amenities including an iron/ironing broad and a full length mirror may seem unnecessary but very appreciated and not always available in small inn rooms. We hope to return soon........Best of luck Roger and Terri! My wife and I got engaged at Capt. Fairfield Inn 10 years ago on a weekend in late January. We returned to once again enjoy Kennebunkport in January. We were treated with a snowstorm on Saturday night which made the weekend even more fun. The house is an antique house with all the charms of an older home including the wide pine floors (a little creaky but no more so than the last visit), beautiful moldings everywhere, cool low banister on the stairs, etc. There are some signs of wear in places, but it did not detract from the overall experience. By no means did we see any sign of the place being dirty. In fact, I thought the place was spotless which is difficult with people tracking in winter mess. Everybody has a bad day, so maybe the previous reviewer was the victim of bad timing. We were treated so well as soon as we arrived. We were asked if we had any food requests/requirements for breakfast which we did. The breakfast was perfect and we were able to try everything except for the scones. (overnight oats, fresh fruit, hot out of the oven frittatas, oven baked potatoes, yogurt, hot coffee and a selection of teas). We asked about places for dinner and were given several options. We decided on Batson river brewery that first night and On the Marsh the second night. The room was very comfortable and quiet. The bed is pretty soft/plush which suits me just fine! The fireplace was very welcome especially when coming in Saturday night from the snow. Sunday morning we were offered to stay as long as we liked due to the storm. We still left at normal checkout and braved the drive home. The innkeeper even gave us her cell number to get in touch with her if we had trouble travelling. She said she would get in touch with their Portsmouth, NH property for us if we needed to cut our travel short due to the weather. Thankfully we made it home without incident. Awesome relaxing weekend. Couldn't have been better. Hate to leave this review, but I think I need to worn anyone who wants to get their moneys worth when staying at a pricy high end Hotel or Bed and Breakfast to look else where. The Inn Keeper was pleasant and I liked her personality! So this is hard to write. The room was pretty but the floor was so worn you could see through to the basement. Severely crooked ! There was hair under the glass in the built inn next to the bed. The long mirror in the bathroom was filthy. The Bathroom shower glass and around the base of the bathroom floor was dirty . In the morning there was a dirty caraf of coffee and when I put the cream in my coffee it curdled. Smelt the cream and it was sour. Pretty disappointed at that point. I thought if this is what coffee is like I wonder what the kitchen looked like? Took a look at the kitchen and decided against breakfast and checked out. I wouldn’t recommend. Lovely stay at this gorgeous inn. It was the perfectly located with easy walk into town. Inn owners were very welcoming. Didn't love the breakfast - it wasn't for us. But overall a very nice and affordable place to stay in this gorgeous town. The Captain Fairfield Inn is nestled in a perfect location in one of the friendliest, most beautiful towns in the US. The staff was extremely courteous and helped maximize our perfect stay in Kennebunkport. Highly recommended for all travelers. Great place to stay. The innkeepers Roger and Terri are great people and a lot of fun. Would definitely recommend Captain Fairfield Inn. Older home but very welcoming. Room was nice, clean and well appointed. Captain Fairfield Inn places you next to Kennebunkport Village Green and within a 10-minute stroll of other popular attractions like Dock Square. This 9-room, 3.5-star bed & breakfast welcomes guests with free breakfast, free in-room WiFi, and free self parking. Free full breakfast is included with your stay and awaits you each morning from 8 AM to 10 AM. For a nice break, mingle with other guests at the free daily manager's reception. Guests can enjoy cable TV and stay connected with free WiFi. The bathroom offers hair dryers, designer toiletries, and bathrobes. Other standard amenities include an iPad, free bottled water, and an ironing board. Guests staying at Captain Fairfield Inn enjoy free WiFi in public areas, a terrace, and a fireplace in the lobby. You can put free parking to good use if you drive. Front-desk staff can help with concierge services, and provide local restaurant recommendations. This bed & breakfast also has a garden. Free full breakfast is served daily from 8 AM to 10 AM. Guests can enjoy a free manager's reception daily. The front desk is available during limited hours. Driving? This property offers free parking.